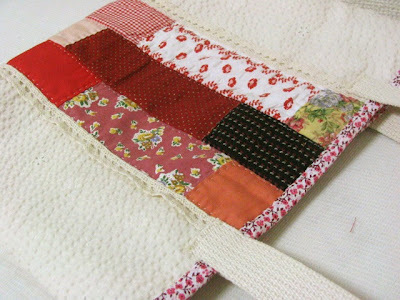 Today, I sewed a bag for my grandmother, for her birthday present. I like her very much from when I was a child. I often visited her house till I was a university student, but now I live very far from her. So when I go back to my parents house, I usually visit her too. But at the last time, in August, she was not so good and I couldn't see her. I know she is old now. So I want to see her and talk with her as much as possible. It's very precious for me talking with old people. So when I stayed in Italy, I visited a lot of old persons lives there. They like talking a lot and they taught me a lot. One of them was 94 years old! Once, when I and my sister were waiting for a bus in Sicily, an old woman lived near the bus stop came to us and brought two chairs for us. We told her that we had to wait for more 3 hours. Then, she began to talk with us. At that time, I couldn't speak Italian well and she could speak only Italian(My sister could speak only Japanese!). So we couldn't understand her story very well but we enjoyed very much. It was a very peaceful time. When I think of my grandmother, I remember a lot of old persons I've met in Italy or in Japan. 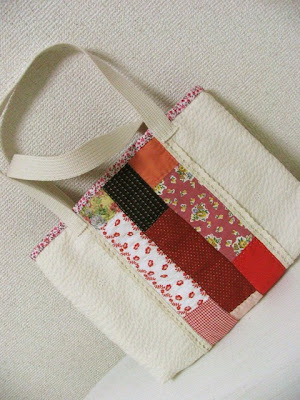 When I was making this bag, I was thinking of them. hello mai, I think your grandmother will like your bag! It is such a nice gift. I miss my grandmother very much and I often think of her when I knit or sew. It is true that you feel peace with some old people even if you can`t talk. Have a good trip! this is a lovely bag. you have a great eye for composition. i'm sure your grandmother will love it..
and we enjoyed our udon very much. i used wakame and genmai miso to make the dashi as that is what i had on hand. but then had to add some soba tsuyu because it was missing something. my husband liked it. and my daughter just wanted to drink the 'soup'. :) so thank you very much. My grandmother liked it and she brought it to the party with her friends. Wow, it is gorgeous! Lucky grandmother. It's beautiful. Hope your grand ma liked it. 3 years ago my grand ma passed away. I still miss her. It's so nice to hear you like to spend time old people. Most people don't have time for them. I'm so happy to be in your blog. I found your blog from www.oneprettything.com and immediately, I can't wait to finish reading your entire blog as your blog is really nice to read with lots of pictures. I really like this entry about the old people. It reminds me of my own grand parents as well! Thank you very much Santhy. I'm trying to write better post. Thank you for reading! Beautiful Bag! It will be lucky to be your grandmother or your niece! Gosh, I love this. Thanks for sharing about your grandmother and the old people you are in touch with. I remember my grandma fondly. She was a lovely person. I'm in touch with a few elderly people in their late 80s and 90s. They are lonely and love to hear from us.